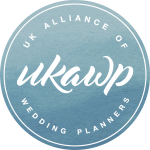 We’re always happy to answer questions or queries about the UKAWP, wedding planning or the UK and destination wedding industry in general. Please get in touch! If you’re a wedding supplier interested in working with our members, please contact them individually through our Membership Directory or, to access an array of further benefits, apply for Wedding supplier partner membership here.